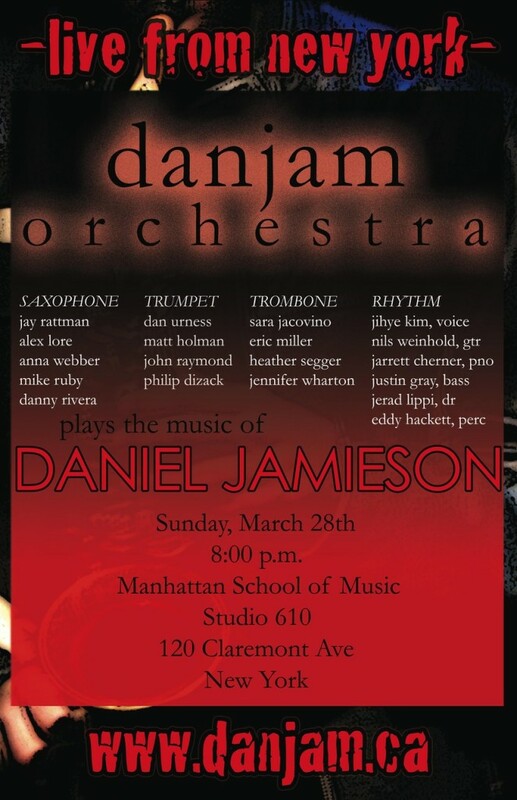 Danjam Orchestra Plays Manhattan School of Music on Sunday March 28th! I just finished sending the music out to the band for our upcoming performance on March 28th at Manhattan School of Music. This concert is free and will be held in Studio 610. We will be performing a combination of standards and originals all arranged by yours truly. Also we will be giving away some exciting prizes so be sure not to miss it! I am very excited to welcome some new faces to the band for this performance including Matt Holman on trumpet, John Raymond on trumpet, Phil Dizack on trumpet, Jarrett Cherner on piano and Jerad Lippi on drums. I must add that I was absolutely thrilled with the band’s performance last week in Toronto. The band completely exceeded my expectations. It was such a treat to hear new soloists’ fresh take on the music. YouTube clips will be coming soon!